How does the gastric band work? How is the band adjusted? 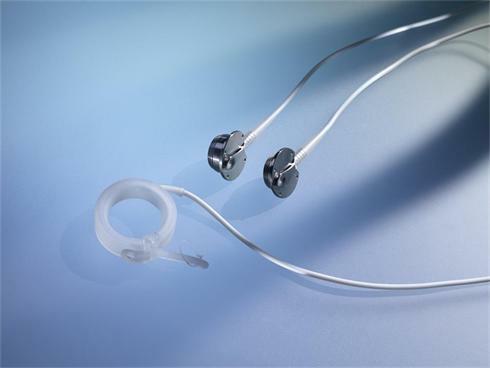 Who is suitable for gastric banding? Does the band last for along time? Is gastric banding surgery safe? How much weight will I lose with the gastric band? What are the benefits of gastric banding? What are the risks of gastric banding? 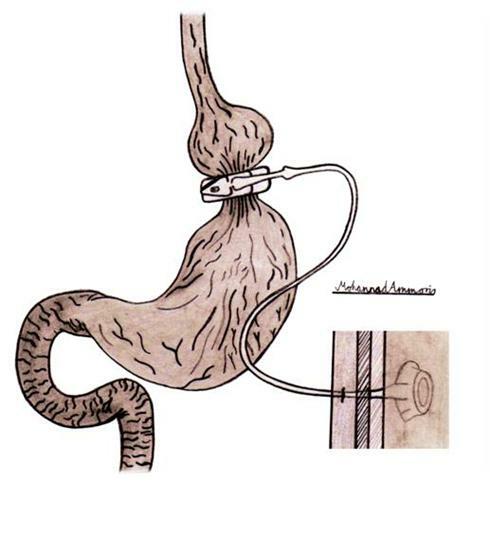 In this procedure the capacity of the stomach is made smaller by placing an inflatable silicone band around the upper part of the stomach to create a new small pouch, which can hold only a small amount of food. The band slows down the passage of food from the pouch to the rest of the stomach, which will make you feel full faster and reduces food consumption and calories intake. The band is inserted using a general anaesthetic laparoscopically (keyhole surgery using small incisions in the abdomen) to encircle the upper part of the stomach and is connected by a tube to a small port that is placed under the skin of your abdomen. The gastric band is designed in a way that can be adjusted to change the size of the stomach pouch by injecting or aspirating saline into the access port. The first band inflation is done about 4-6 weeks after surgery. In March 2011, The International Diabetes Federation (IDF recommended bariatric surgery to patients with BMI 30 kg/m2 (Asians from BMI 27.5 kg/m2) if their diabetes was poorly controlled. However, the need for surgery to aid weight loss is dependent on discussion with the bariatric team who will provide you expert and comprehensive advice. Our experience is limited to the years since 1993 when the first gastric band was fitted. However, a gastric band is designed to remain permanently. It is made?entirely of biocompatible materials, so the band can stay in the patient’s body without causing harm. 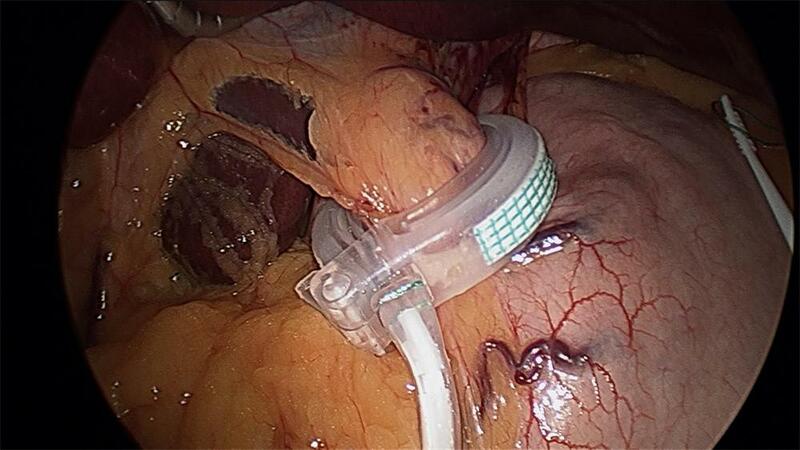 Gastric banding operation is simple, safe and effective. Professor Basil Ammori (based in Manchester, UK) has performed approximately 1000 procedures, all by keyhole surgery, and with no loss of life. The weight loss achieved with the band is significant (on average 40-50% of the excess weight is lost over 12-24 months). Although you might feel full with a small meal, the band doesn't’t reduce hunger fully and does not stop people from snacking or taking additional calories through sweets and high-calorie drinks such as alcohol. 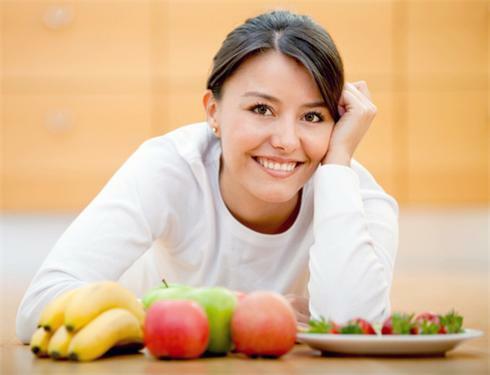 It is essential therefore that one should control these aspects of eating and drinking as well as exercise in order to achieve the desired result. Otherwise, 1-in-10 people could fail to achieve any substantial weight loss. Significant weight loss up to 40-50% of excess body weight within 2 years. Marked improvement or resolution in health conditions related to obesity, particularly type-2 diabetes (approximately 50% chance of resolution), hypertension (60% chance of resolution) gastro-oesophageal reflux, obstructive sleep apnoea (75% chance of resolution), asthma, liver disease, high cholesterol, and painful osteoarthritis. 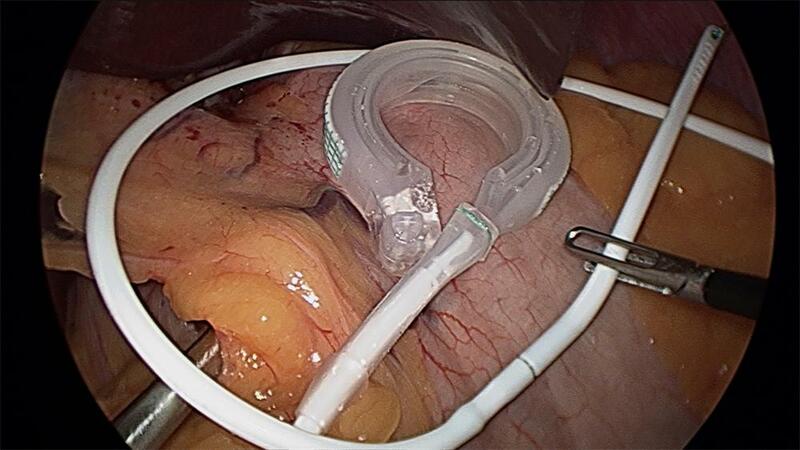 Compared with other types of weight loss surgery, adjustable gastric banding is fully reversible by keyhole surgery, adjustable, less invasive, takes less operating time (average, 25 minutes), can be performed as a day case procedure, does not interfere with absorption so vitamin deficiencies are less likely to occur as well as lower risk of dumping syndrome. Pouch dilatation: this happens in up to 8 out of 100 people, and requires the band to be either re-positioned or removed. Band erosion: this happens in 1 in 100 people, and requires the band to be removed and the hole in the stomach closed. Port or tube leaking: this could be replaced with a new piece. Port infection: this requires the port to be removed and a new port to be placed 3 months later. Severe acid reflux, and rarely oesophageal (gullet) dilatation: this requires the band to be fully deflated and preferably removed. It is not advisable to have a gastric band if you already suffer with severe acid reflux. 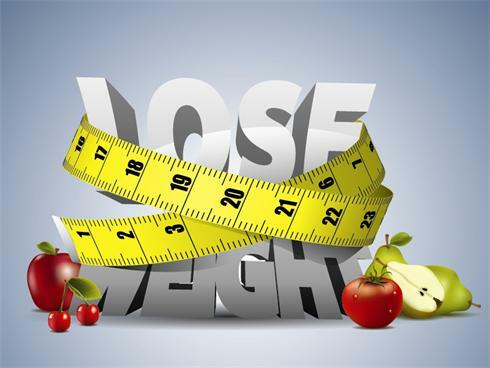 Approximately 1-in-5 people could regain the weight they lost within five years after surgery. The success of this type of surgery, however, also depends on your motivation and commitment to achieving long-lasting weight loss. The price quoted is inclusive of the cost of all tests at pre-assessment, the Gastric Band operation with all associated fees (hospital, surgeon and anaesthetist), as well as follow up with the surgeon, dietitian and bariatric nurse for two years. In the very rare instance that you might need additional tests, a return to theatre for any unforeseen reason, or to stay in hospital for longer, you won’t be charged any extra fees for the first 30-day after your operation.